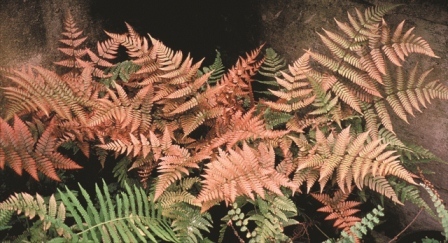 Eye catching fern that provides colourful ground cover with pink fiddleheads that turn coppery orange as they unfurl. A best seller last year. Care: Dry/wet – moist shade or semi-shade, preferably on the dryish side, a typical shady border, often with some trees overhead. This fern is a stunner. It starts in the spring/early summer with copper red fronds which slowly change to pale deep green then pale green. Mine has 3 years of leaves on and still looks good. Good in pots.Mine is in permanent shade and does well. Click the button below to add the Dryopteris erythrosora 'Brilliance' to your wish list.